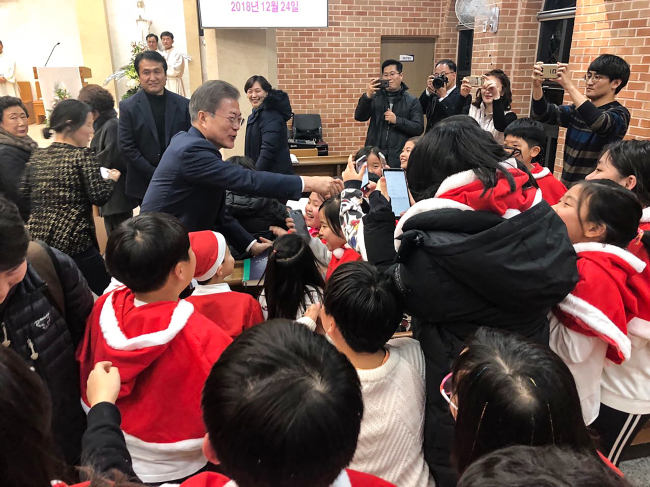 By citing a poem by popular poet Park No-hae, he wrote, "On Christmas morning, I am thinking of Jesus Christ's warmness that we all have in our hearts." The poem titled "A Poem of That Winter" depicts the warmheartedness of a grandmother who worries about how the poor and weak are surviving in the brutal cold. "The grandmother's heart is the same as that of Jesus," the president wrote. At the bottom of Moon's message is a picture of six little puppies wearing winter scarves that were born to a dog that North Korean leader Kim Jong-un gave Moon as a present during their September summit.